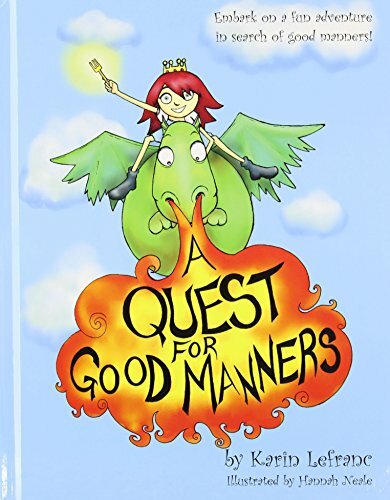 A Quest For Good Manners is an interesting and fun way to teach good manners to children. A Quest for Good Manners begins with an appalled queen sitting angrily by the dinner table watching her daughter, Princess Rosalind, along with her pet dragon, Sparkler, eating their evening meal. It was not the company of the dragon that was setting her off—no—the problem was how they were eating. They were talking with their mouths full, slopping food all over the table, slurping, burping—not using any manners at all. Eventually, the queen has enough of the rude manners and yells at the princess, giving her an ultimatum: She has three days to learn good manners or Sparkler is out. Well, that won’t do, Sparkler is Rosalind’s faithful friend. Rosalind enlists the help of Percival the wizard to help her. He gives her a challenge: helping her to hold a fork properly. She then runs across a fairy with purple wings who teaches her how to say please and thank you; then she also gives her a challenge that she must pass. The last challenge is given by Lady Grace, an elegant woman who lives in an ice castle. Though Princess Rosalind’s manners are improving, will she be able to complete her task in learning good manners before the three days are up? This 32-page picture book is a fun and meaningful way to demonstrate to children that good manners are not just boring rules but a show of kindness and consideration to others. Politeness = respect of others. The illustrations by Hannah Neale are bright and colorful, adding another layer of delight to the unusual pair’s adventure. Children will begin to understand what having good manners are all about—and how important it is to have them.